Versatile: permette di realizzare matrici di gomma sia naturale che siliconica con staffe rettangolari o rotonde. RELIABLE: electronic control of vulcanization time and temperature with digital precision. VERSATILE: allows production of matrices in natural or silicone rubber with rectangular or round stamps. Duplex. The only multifunction, compact innovative reliable vulcanizer. Great versatility of use with heating plates 150x150 mm. Quick setting of vulcanization time through the analogic timer . 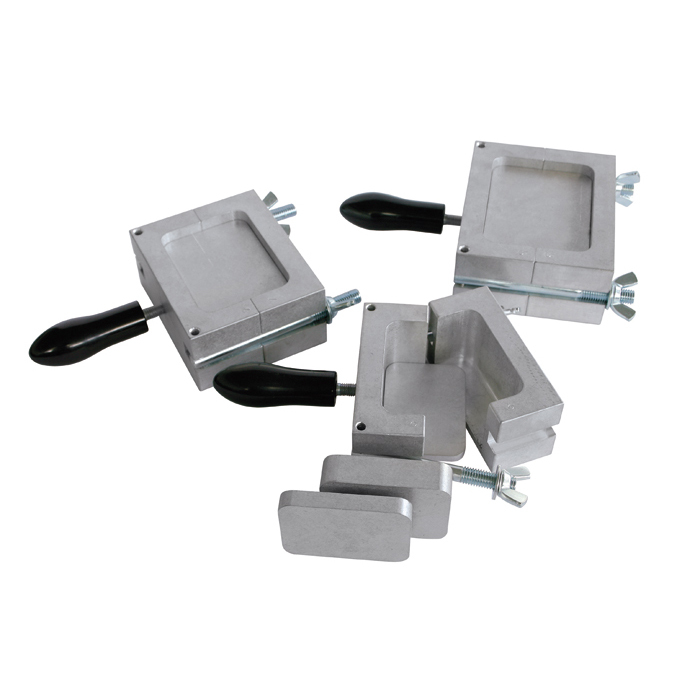 the function of the heating plates (2-5) is to transmit the vulcanization heat to the flask (4), while the central piston (3), since it can descend inside the flask, is used to compress the rubber mould (6). This is the perfect configuration for using cylindrical or rectangular flasks with metal spacers sliding inside (7-8). fixing the kit (3) to the upper heating plate (2) with the 4 screws (7) the descent of the central piston can be blocked. In this configuration, the upper heating plate not only transmits the vulcanization heat but also compresses the rubber mould (6). This is the best method for using rectangular flasks without internally sliding spacers. Staffe per vulcanizzatore disponibili in versione tonda (realizzate in acciaio) o rettangolare (in alluminio con pastiglia premi gomma in acciaio).